But there was one thing in particular that caught my fancy…what I thought was a brilliant use of this new, interactive site that outranking is all the rage: Pinterest. 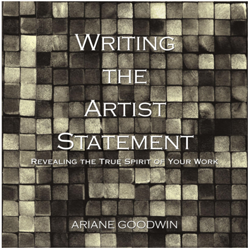 I’ve collected and analyzed over 100 artist statements to date and have only found one that I would rate as with 5 stars: Geoffrey Gorman’s, which was so good that Ariane introduced him by reading it. While artist statements do not seem to keep great artists from selling, those of us who are building our careers need to have every edge we can get. To this end, I’ve created a Pinterest board* with the beginning sentences of artist statements, alongside a piece of their art, and my ratings, based on the assumption that if we don’t engage a reader with those first sentences, we’ve probably lost her or him completely. You will see that the collection of statements from successful artists are not much better than those of average artists. You can also see an evaluation of statements I picked up at one gallery here in my blog post. My challenge, if you want to participate, is to submit the first sentence of an artist statement that you think would really grab readers and stimulate their interest in you and your art. For my opening sentence, I found *Eden Maxwell’s exercise of “Why am I an artist?” to be very powerful. It prompted me to rewrite my artist statement. 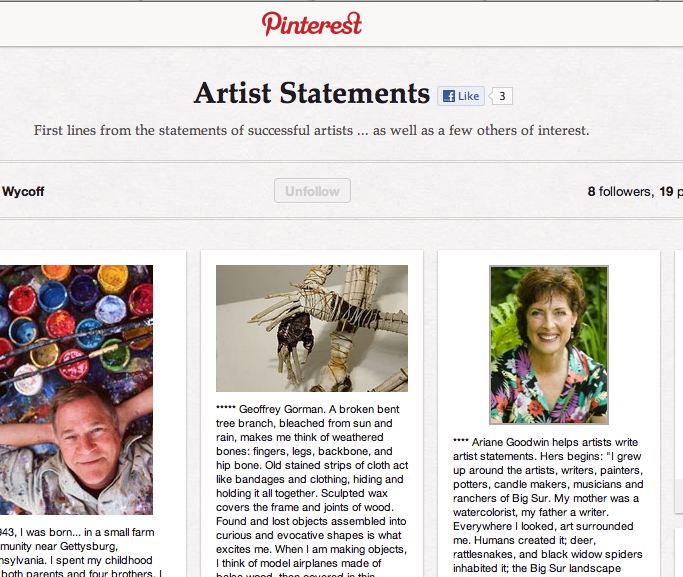 If you decide to play, and if your opening sentence rates 4 or 5 stars (my call), I’ll post an image of your art from your website along with your first sentence on the pinterest board. If I don’t think you get at least a 4, I’ll use the skills I’ve earned as a published author with a marketing background to give you feed back so you can try again. 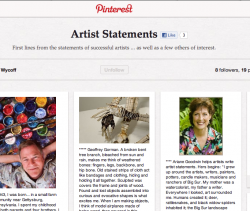 If you haven’t discovered Pinterest.com, you may want to avoid it … it’s utterly addicting! In the smARTist Community Forum (only open to participants of the live event), another artist gave us a link to two articles on the rising star of Pinterest. 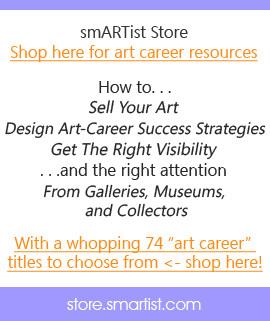 *Eden Maxwell’s exercise of “Why am I an artist?” was a core component of this year’s smARTist Telesummit conference. Eden understands that without a foundation of self-awareness, most artists will flounder and fail. His elegantly simply, and skillful, three core questions and how to answer them, was a highlight of the 7 days. Did you miss it? No worries. Sign up for notification of the Home Study Edition of the conference and we’ll send you the info as soon as we launch. So, tell me: are you on Pinterest yet? And what do you think of it?